Alfresco living has never been so stylish and carefree. The Town Court slatted fire pit table looks like slightly distressed wood, but is actually crafted from durable, weather-resistant aluminum for years of enjoyment. The propane fire bowl conveniently ignites at the push of a button. The included burner cover transforms the fire pit into a coffee table, perfect for all your entertainment needs. Cushioned aluminum fire pit chat set. Super high back and roomy spring action lounge chairs. Rust free aluminum with steel reinforced spring base for chairs for extra strength. High performance Nuvella fabric. Square aluminum top fire pit includes: CSA approved 50,000 BTU stainless steel burner, glass beads, burner cover and weather cover. Battery operated igniter (battery included). Can be converted for natural gas use. Assembly required. 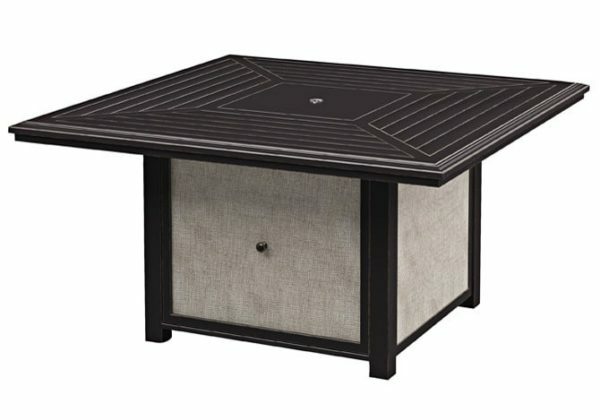 P436-772 Square Fire Pit Table has sling panel sides.